When Opportunity landed on Mars, scientists could see bedrock a short distance away. The rover's mast is stowed on the left. 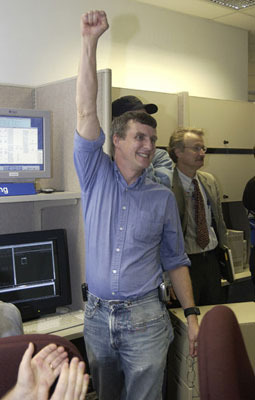 On Jan. 24, 2004, halfway around the planet from Spirit's landing site, the airbags cushioning the Opportunity rover slammed into the surface, bounced high into the atmosphere, hit the ground again, and continued bouncing and landing and bouncing and landing before slowly rolling to a halt. In California, members of the science team waited. When they finally got a signal that, as though to make up for the heartbreaking loss of two spacecraft en route to Mars in 1999, this time they had landed not one, but two rovers on Mars, they broke out into applause and celebratory smiles. They cheered and hugged each other. Volcanologist Joy Crisp, project scientist on the rover mission, sits beside basaltic, volcanic rocks used to test the rover's driving capabilities and the toughness of the airbags during landing. Even so, they were not prepared for what they saw through the lenses of Opportunity's panoramic camera. 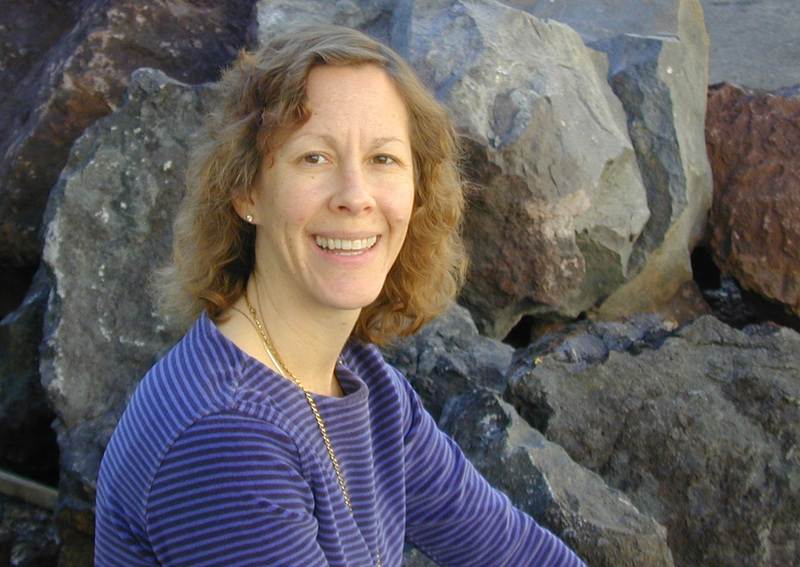 "Opportunity got very lucky," said volcanologist and Project Scientist Joy Crisp. "We found rocks in place. Geologists get very excited about finding rocks in place. We didn't know we would see rocks in the same place where they had formed. "This is all part of exploration. You don't know what you're going to find." 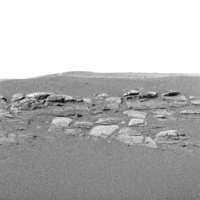 Scientists saw layered rock within a stone's throw of Opportunity's landing site in Eagle Crater. Geologist Steve Squyres, principal investigator for the science instruments on the rovers, who first began working on the panoramic camera in 1987, describes the first pictures from Meridiani as one of the most exciting moments of the mission. "There was no question the night we landed that we had layered bedrock within easy reach of the vehicle," he said. "We had no understanding at the time what we were looking at, but we knew we had stumbled across something wonderful." Cornell Professor Steve Squyres rejoices upon seeing the first images from Mars. The layered rock, about the height of a New York City street curb, was a stone's throw from Opportunity's landing site. 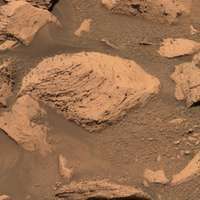 It was the first bedrock outcrop ever examined up close on Mars. Until then, scientists had only seen hints of layered rocks from satellite images. Rocks in place tell a story about their environment. They provide clues to physical processes such as water erosion, wind erosion, lava flows, and temperature and pressure conditions in the past. If a rock has been carried elsewhere, it is difficult to know what its environment was like. 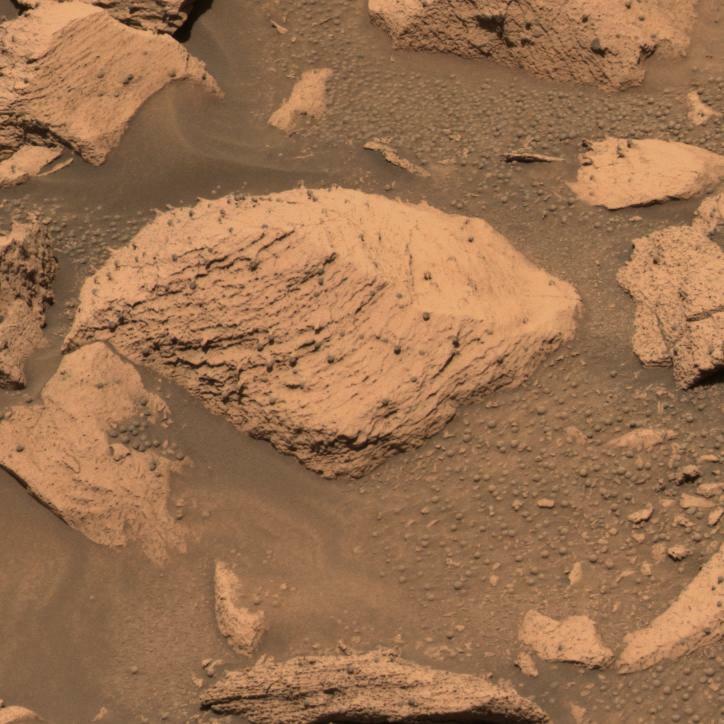 Scientists would, within a few short weeks, read a story in these rocks beyond their wildest dreams. Fine, millimeter-scale layers and spherical grains in a rock dubbed "El Capitan" in Eagle Crater are seen in this approximate true-color mosaic from Opportunity's panoramic camera. 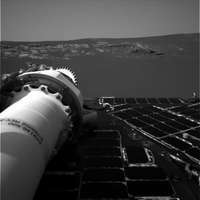 On March 2, after Opportunity had unfolded its solar panels, snapped its wheels and scientific instruments into place, and rolled off its landing platform to explore the local martian real estate, scientists announced that Eagle Crater, where the rover landed, was once a water-soaked place. 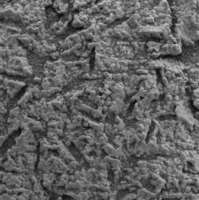 This finding meant that, in fairly short order, researchers from NASA and participating universities, who are trained to be skeptical of scientific conclusions without a great deal of corroborating evidence, had now agreed that Mars was once much wetter than the barren landscape encountered by the earlier Viking and Pathfinder missions. It also meant they had achieved their goal. The primary reason for sending rovers to Mars, the reason why NASA was funding the mission, was to look for signs of past liquid water. If evidence of water were found, the next questions scientists would seek to answer would be what the environment was like when water was present and whether past environments were favorable for life. Even without knowing what that life might look like, researchers surmised that water would have to be present. From the tiniest bacterium to the largest tree, life as we know it requires liquid water. 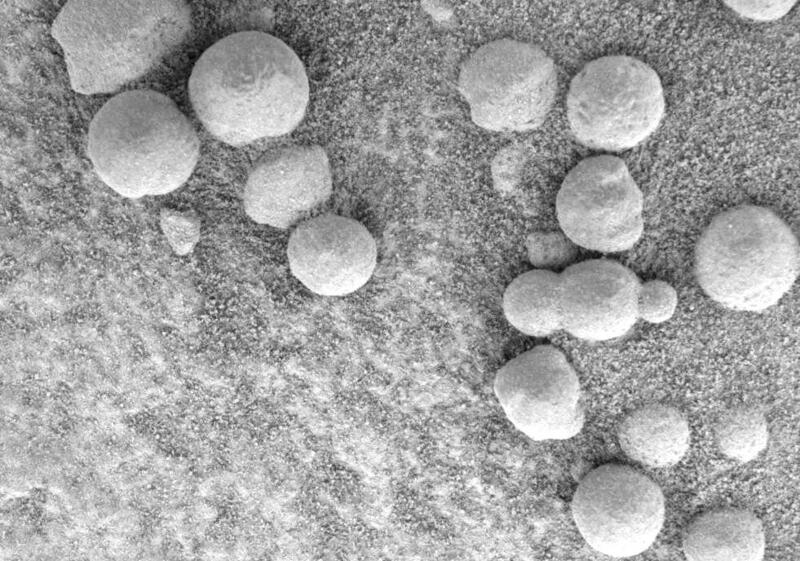 Scientists determined that spherules the size of BBs, shown by Opportunity's microscopic imager, were largely made of hematite, a mineral that often forms in the presence of water. 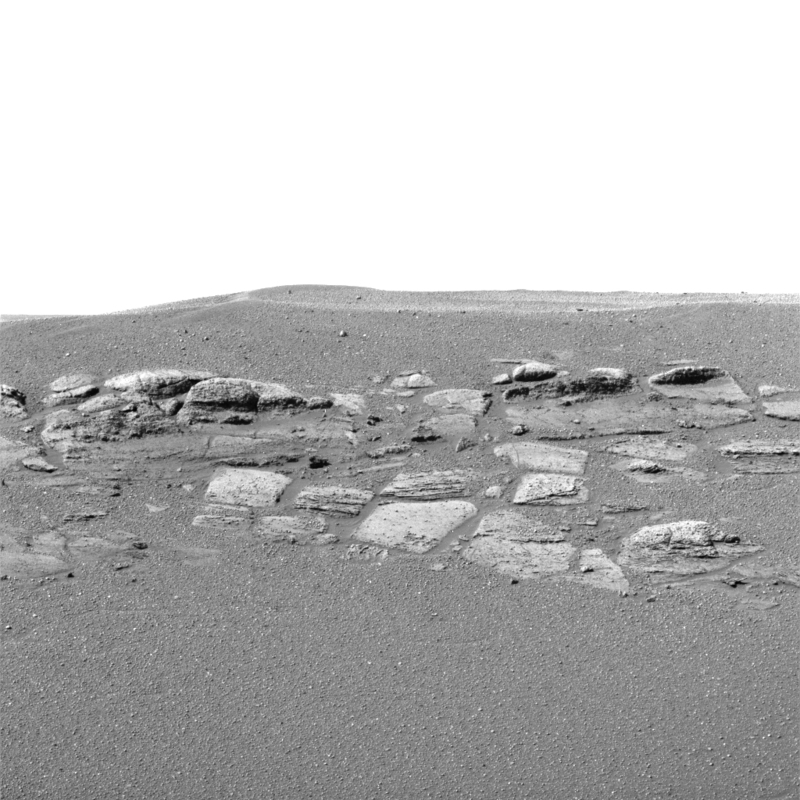 Using Opportunity's investigative toolkit to read the record in the rocks, scientists had collected four kinds of evidence for significant amounts of past water, said Crisp. First, they discovered tiny spherules the size of BBs that, based on their shape, were likely volcanic, impact, or aqueous in origin. Because they were not associated with particular layers of rocks and they were rich in the mineral hematite, scientists concluded they had probably formed as concretions do on Earth, taking shape gradually as mineral-laden water deposited hematite on sand grains or rock fragments. They measured high amounts of sulfur, chlorine, and bromine that are associated with mineral salts deposited in brines as they evaporate. 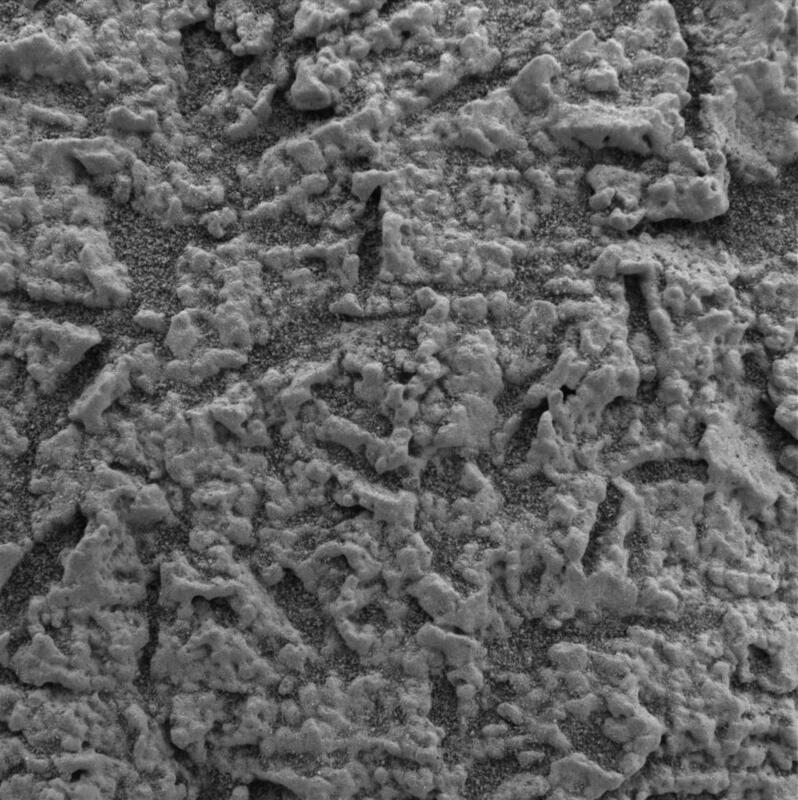 Randomly oriented, vacant niches shown in this microscopic image of an area about 3 centimeters (1.2 inches) wide, are similar to those left behind in rocks on Earth after evaporite minerals, such as sulfates, have been dissolved by water. They also discovered a hydrated iron sulfate mineral called jarosite that typically forms in acidic lakes or hot springs. Finally, scientists observed randomly oriented cavities in the rock that looked a lot like those found on Earth where minerals that once formed in brines are later redissolved by water. The "vug," or hole, left behind retains the shape of the mineral that used to be there. The realization that the rocks at Meridiani told a story of liquid water came at different times for different people, said Squyres. "Everyone goes into something like this with their own set of expectations," he said, "their own prior experiences, their own way of interpreting things that they see in the data. 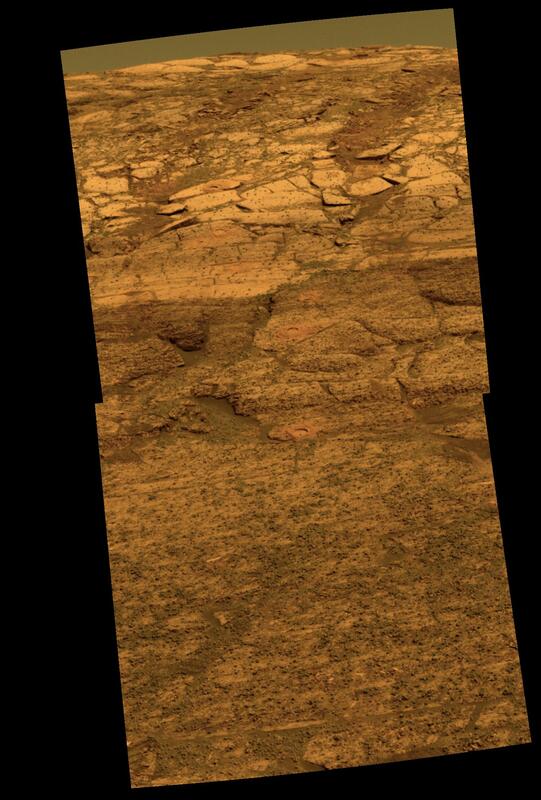 The Opportunity rover would continue to encounter finely layered rocks on Mars throughout the expedition, such as those visible in this approximate true-color image of a rock dubbed "Pilbara." "Some people on the science team were convinced very early that the rocks pointed to a watery past. Others were skeptics. I was somewhere in the middle, leaning toward the skeptical side. But, for each of us, there was a moment at which the data stacked up to the point where it made an argument that convinced us. For me, it was some particular pictures of a rock called 'El Capitan.'" "El Capitan" was peppered throughout with small indentations, or vugs, less than half an inch long and about 1/8th of an inch wide. It featured fine parallel layers that were likely sediments deposited by water. Of course, ever cautious about overstating their findings, scientists speculated that relatively small amounts of groundwater circulating below the surface would be sufficient to create the features they had seen. Scientists could see crossbeds, in which layers of rock dip toward each other, as illustrated in this false-color image of a rock dubbed "Last Chance." That perception, too, was about to change. The next big announcement, so stunning that members of the science team had to travel to NASA headquarters a second time to explain their findings, was that the rocks exposed at Meridiani had seen a great deal more water than a slow subterranean seeping. "Based on the crossbeds and the ripple marks in the rocks in conjunction with the earlier findings," says Crisp, "the best explanation of these rocks is that they were deposited in a salty body of water that was flowing." Ripple marks such as those shown here were deposited by water moving back and forth. Crossbeds are rock layers that dip at an angle to the main horizontal layers. Ripple marks are wavelike peaks and troughs in fine-grained sediments formed by water moving back and forth across the surface. Now it had become clear that in Meridiani Planum, the rocks had been deposited in flowing water in a salty sea. It's possible that a shallow sea once covered the entirety of Meridiani Planum, extending for kilometers in every direction. The characteristics of the environment were favorable for life, if life ever existed at this place and time on Mars. Opportunity made scientific measurements of many layers of rock, exploring deep into the martian past. "Endurance Crater" is the length of 1 1/2 football fields (150 meters, 492 feet) from rim to rim and more than 20 meters (66 feet) deep. Now it had become clear that in at least some places, the martian surface had been shaped by flowing water. It's possible that a shallow sea once covered the entirety of Meridiani Planum, extending for kilometers in every direction. And the mission was still young. Opportunity went on to examine a deep crater dubbed "Endurance Crater" with many meters of layered rocks that had formed in place before being exposed by a meteorite impact. Scientists determined that these rocks had formed during episodes of evaporation that partially dried up the sediment and left behind minerals such as jarosite and hematite, both iron oxide minerals that form in wet environments. 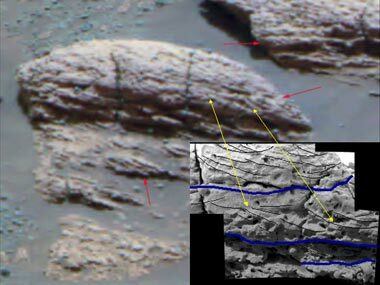 The sheer depth and the many layers of evaporitic rock implied that water was present on the surface of Mars for a long time. Opportunity used its rock abrasion tool to grind holes in many layers of rock and take measurements of the chemical elements in each. 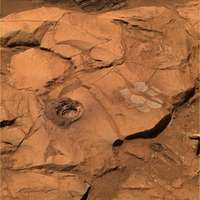 Holes in this approximate true-color image are bordered by a ring of dust that is slightly pinkish in hue relative to the surrounding rock. "It's a major step just to say liquid water had to be here," notes Crisp, "but to actually say the water was flowing, it was salty, it hung around for a long time, and it was extensive for large distances - all those things - it's just really lucky to be able to have all those clues." While scientists don't yet know whether life ever existed on Mars, they are confident that sedimentary deposits like those at Meridiani would be a good place to start looking for it. "To preserve fossils," explains Crisp, "you need a quiet depositional environment as opposed to a more violent one. A catastrophic flood with boulders crashing around is a bad environment to preserve fossils. We know this from Earth. Fine-grained sedimentary deposits and precipitates are good, because they capture whatever things are there in a gentler fashion and lock them into the rock as it's forming." "West Spur" of "Columbia Hills"
This mosaic of images from Spirit's panoramic camera shows a commanding view of Gusev Crater. On the horizon can be seen the rim of the crater. For months, the geologic findings of the Opportunity rover dominated headlines about the mission. While Opportunity was exploring Endurance Crater, Spirit was traveling more than 1.5 miles to a cluster of hills that NASA had christened in honor of the seven astronauts that died in 2003 on the space shuttle Columbia. By then, its right front wheel was wearing down and engineers were concerned it would fail. They figured out how to drive the rover backward, even uphill, on only five wheels so they could save the sixth wheel for critical maneuvers. As Spirit approached the flanks of the "Columbia Hills" six months after landing on Mars, it encountered rocks that appeared to be hollowed-out shells whose soft interiors had been eroded away, perhaps by water. Scientific analysis showed that the rock dubbed "Clovis" had been highly altered and contained higher levels of the elements sulfur, chlorine, and bromine than are normally encountered in basaltic rocks. The material in the rock was so soft that the rover's rock abrasion tool readily drilled a 9-millimeter (0.35-inch) hole in it. To the right is a "brush flower" of circles produced by scrubbing the surface of the rock with the rock abrasion tool's wire brush. 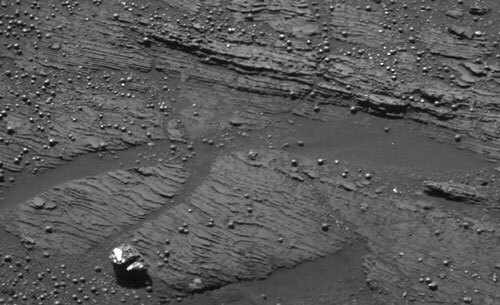 It was then that Spirit began doing "martian mountaineering" and "some pretty serious rock climbing," as Squyres described it at a press conference in August 2004. At the crest of a promontory known as the "West Spur" of the "Columbia Hills," about 30 feet (9 meters) above the surrounding martian plains, Spirit encountered an outcrop of highly altered rock. The softness of the rock along with elevated levels of bromine, sulfur, and chlorine suggested some sort of water-based alteration. Scientists are continuing their quest to compare the so-called "Clovis" outcrop to other, less altered rocks in the vicinity to determine what sort of water-based processes visited the area in the past. Examples may be volcanically heated water circulating through the rocks, briny surface water saturating the rocks, or water vapor in volcanic gases passing through the rocks. Both of NASA's Mars Exploration Rovers have come a long way since Spirit took its first look at the martian terrain shortly after landing Jan. 4, 2004. In the upper left corner of this image, the "Columbia Hills" are visible, more than 3 kilometers (1.8 miles) away. Whatever researchers learn in the weeks and months to come, the members of the NASA team working on the Mars Exploration Rovers have met their goal of documenting a watery past on Mars. They were able to do this not only based on years of planetary research, but because the performance of the rovers, thanks to the people who built them, was such a resounding success. "We should not lose sight, amidst all the happiness over the scientific findings, of what a remarkable engineering accomplishment this is. If you look at what these vehicles have done, if you look at how much Spirit and Opportunity have raised the bar in terms of what is possible on the surface of another planet, it truly is a remarkable achievement. "If you look at what we're doing daily now with Spirit and Opportunity, we are pushing both of those rovers absolutely to the limits of their capabilities. "It's funny. When we first built them, we babied them, we coddled them, we dressed up in funny suits, we had rubber gloves on, we tiptoed around them and were extremely careful. Now they're scratched, beat up, and dirty. We have pushed them to their limits on Mars, climbing the steepest slopes that they could climb, going down slippery inclines, drilling RAT holes into rock while perched on a precarious slope. "And they, by being so capable, are pushing us to our limits as we find new things for them to do." Fitting words, indeed, for an interplanetary journey that will doubtless be remembered for a long time to come.